Bridge2 has been working in Greece supporting the refugee crisis since April 2016. 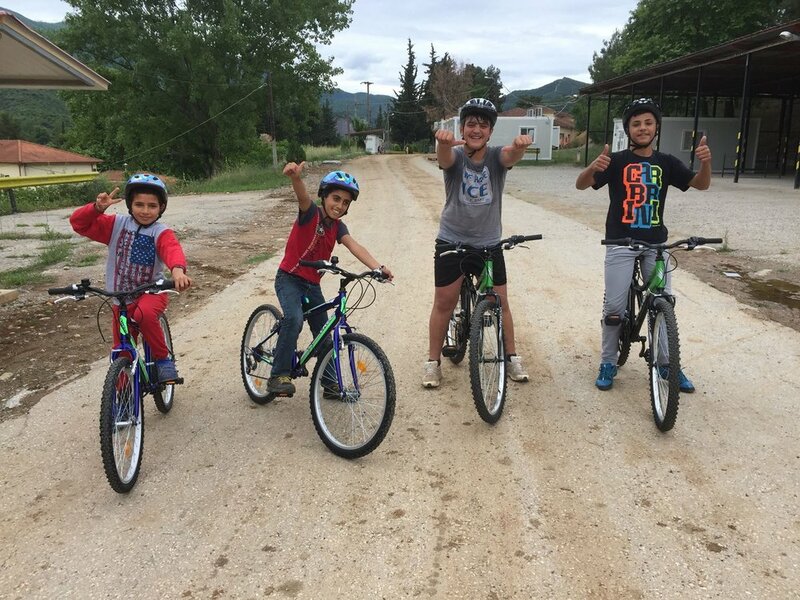 Starting in Alexandreia, Bridge2 was partnered with Refugee Support Greece to provide experience and funding to set up and establish the operations on the camp providing clothing, food and activities for adults and children alike, including a community space. 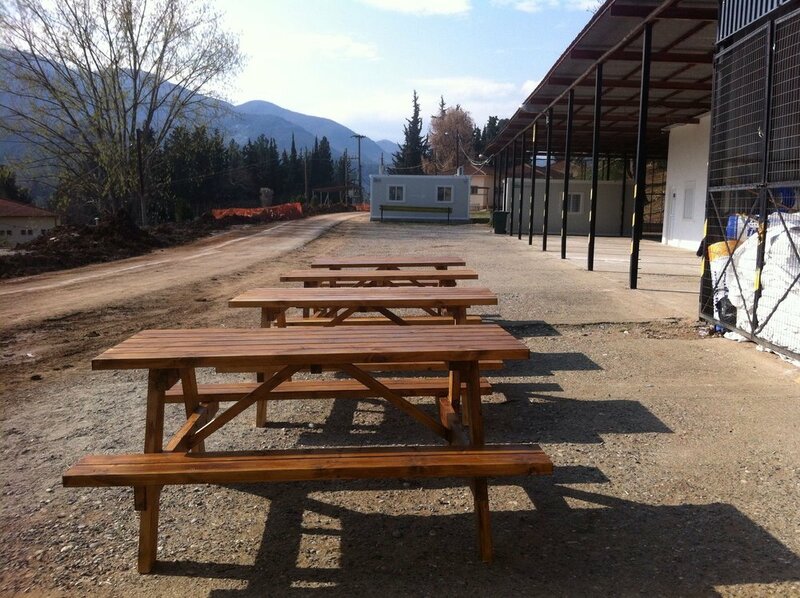 Fast forward to October, things on Alexandreia had now been established and running smoothly, Bridge2 moved on to a camp near the city of Veria to start a similar project. The refugee camp is based at the foot of the mountains set as the backdrop to the city of Veria, on an old military base. The residents are housed in 4 buildings across the camp, as such it is deemed most suitable for vulnerable cases, pregnant women, new mothers, disabilities and illnesses. The population moves from 250 to around 350 but has a capacity of roughly 400. 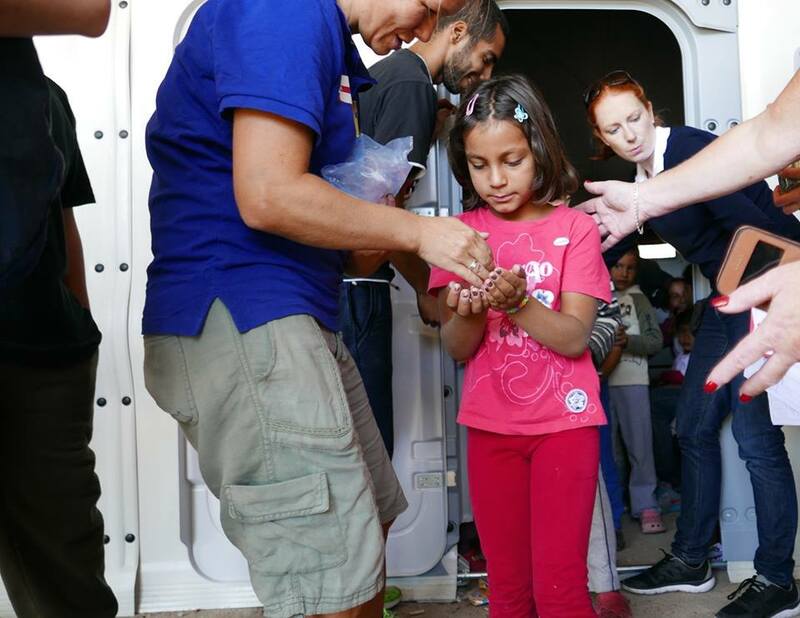 The numbers are dependent on relocation efforts from the UNHCR or the Greek Ministry. Bridge2 quickly setup on the camp, renovating the available rooms set inside a single floored storage building. 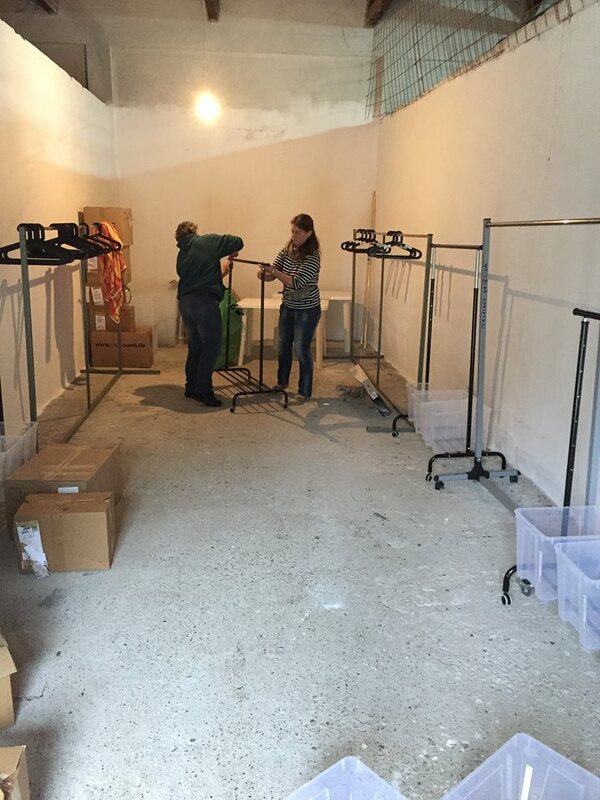 With the help of Refugees Foundation, we were able to not only get the rooms setup quickly but also to stock them with items to give out straight away - clothes, shoes, hygiene (en masse! ), baby products...the list goes on. We created an office, a space for fresh fruit/veg deliveries and storage, a shoe shop, a supermarket and a clothing shop with storage and sorting rooms next door. We have earmarked one room to become a women's space and the renovation of a small building near the distribution points for a men's space. Work started soon on realising the men's space with the builders fixing a damaged wall and laying a new floor. 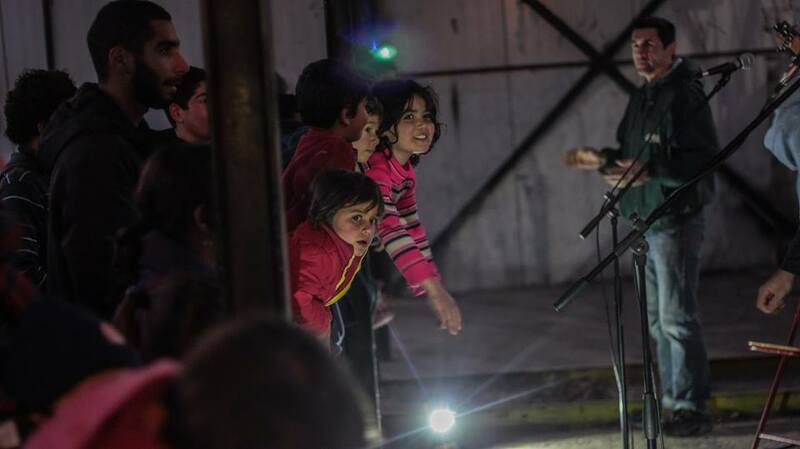 In cooperation with the other organisations on the camp and the military, things started progressing. 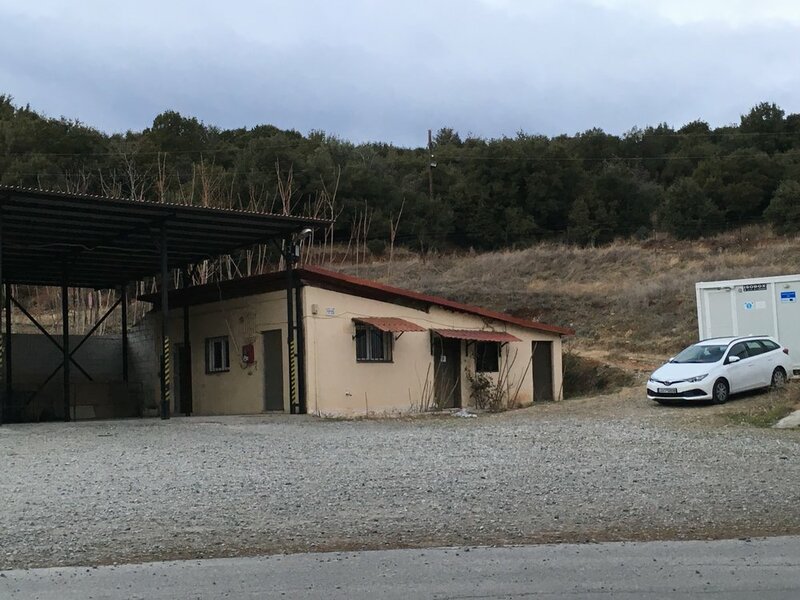 An awning across the building was installed via the military, providing shelter for the residents while they wait at the various distribution points. We've created some 360 shots of the spaces we use and other areas of the camp here. Our Facebook page is filled with daily content and stories on the camp. To keep updated check out the Bridge2Refugees page. If you're interested in volunteering, click here. Formerly the clothes distribution point, now the supermarket, opens twice a week on a Tuesday and a Thursday, offering a consistent supply of goods for free, some are offered on a "take as much as you need" basis while others are given out respective of members in the family. We offer extra food items high in protein for pregnant and nursing mothers. The residents have a timeslot which is organised by building on each supermarket day and the entire camp is served in one day. They bring a shopping bag distributed by Bridge2 which is then filled with the goods on offer for that particular day from fresh food, to tinned food, vegetable oil, yoghurt & milk, hygiene items and other products that we can offer as and when they are available. 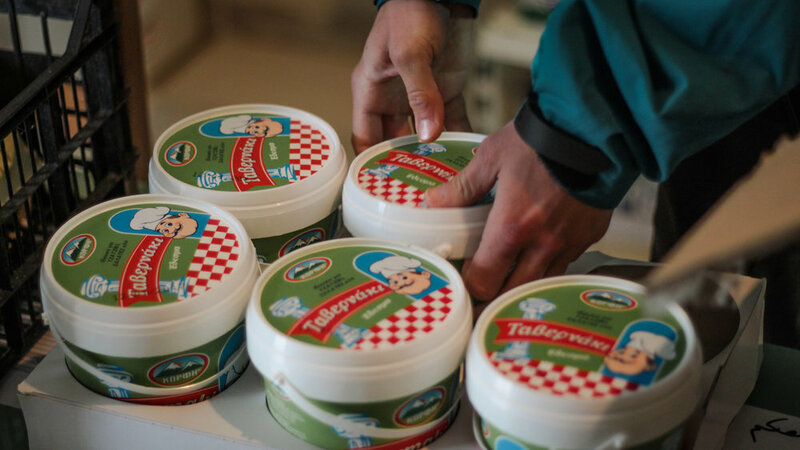 These are all vital items for the wellbeing of the people on the camp, through nutrition and comfort of everyday items such as toothbrushes and toothpaste. Sometimes it turns into a Toy Shop too! We rely on funding to make this happen, and have thus far we've been supported enormously by Refugees Foundation, Help Refugees and Donate4Refugees. 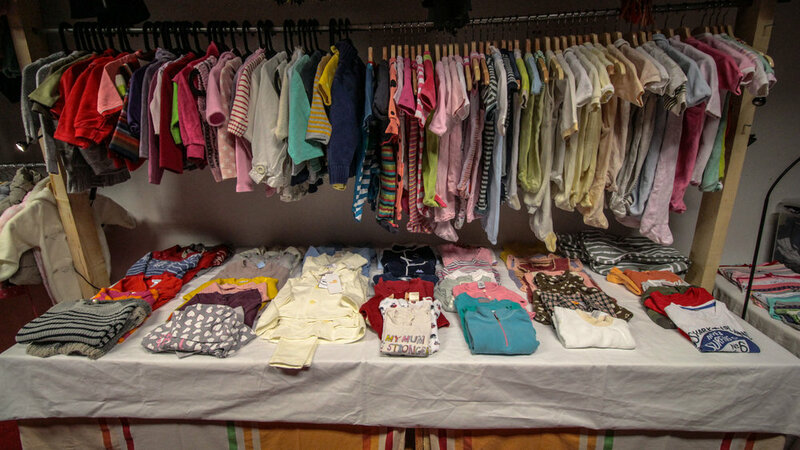 Originally starting life as a room full of old boxes, it has now become a clothes shop offering clothing to babies, children and adults. 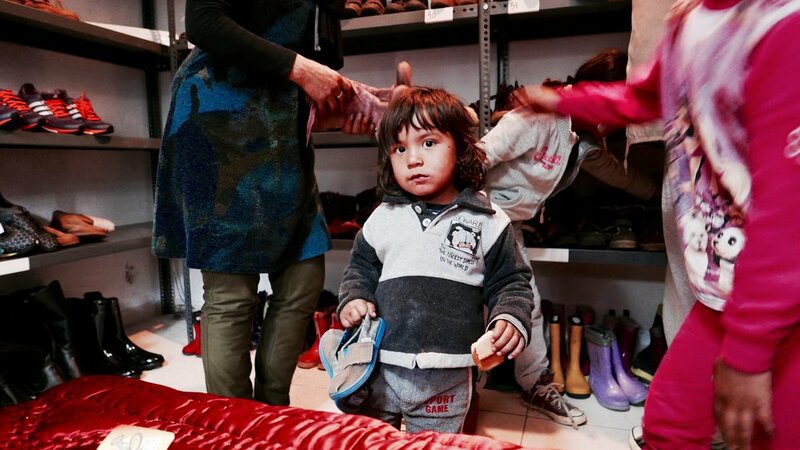 It takes a week to run the shop so that everyone on the camp receives clothes. 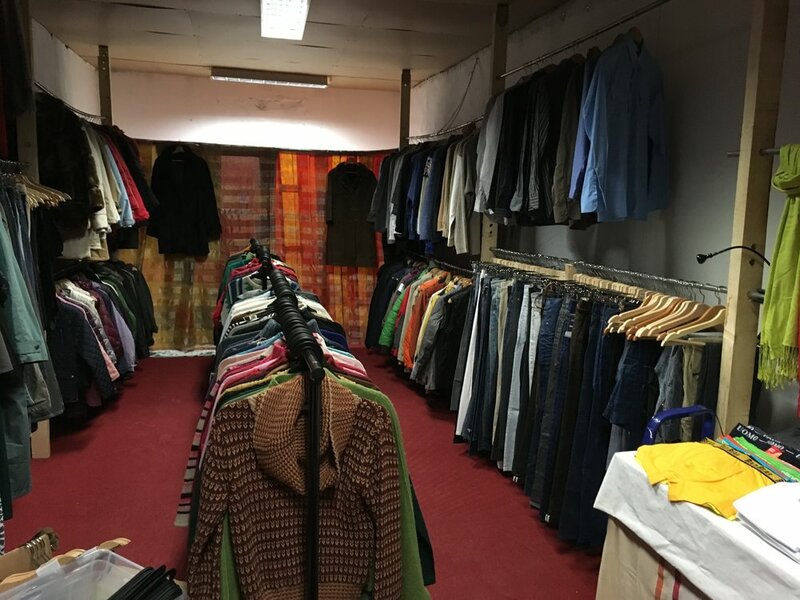 We serve one of the four buildings each day, so the residents can pick their new clothes in a calm environment and try them on in the changing room. This relies on the donations of clothing or funding from others, again we've had great support with this from across Europe, local Greeks and other organisations (Help Refugees, Epigrafes Nea Magnisia). 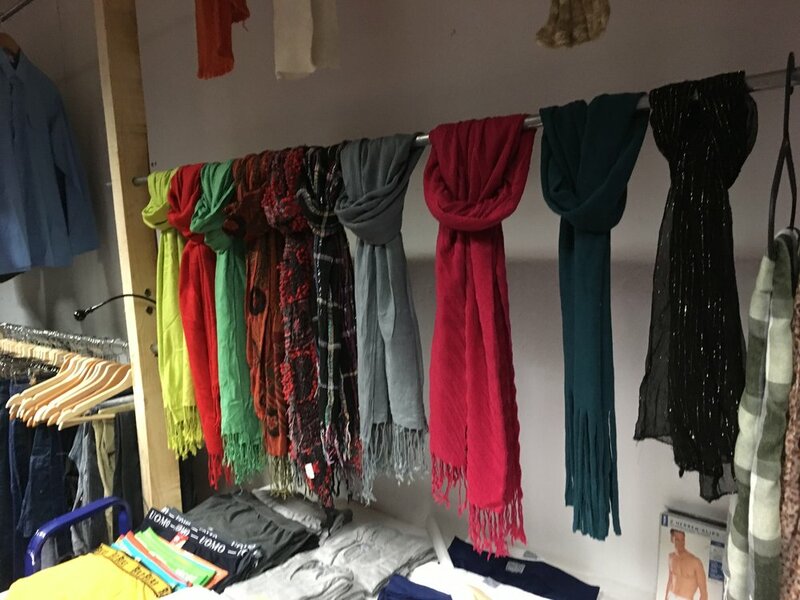 The shop has gone through a few transformations and with the help of Refugees Foundation, we were recently able to maximise the space for both storage and display in the shop by putting in a ceiling which also serves to keep the heat in. Goes without saying really. The shoe shop! Shoes are difficult to distribute as picking some out is always a particular situation. Everyone has a different style and taste, clothes to match. We are always on the look out for new shoes of course and partnerships on this are most welcome (hint hint Nike and Adidas). The men's space is almost finished. 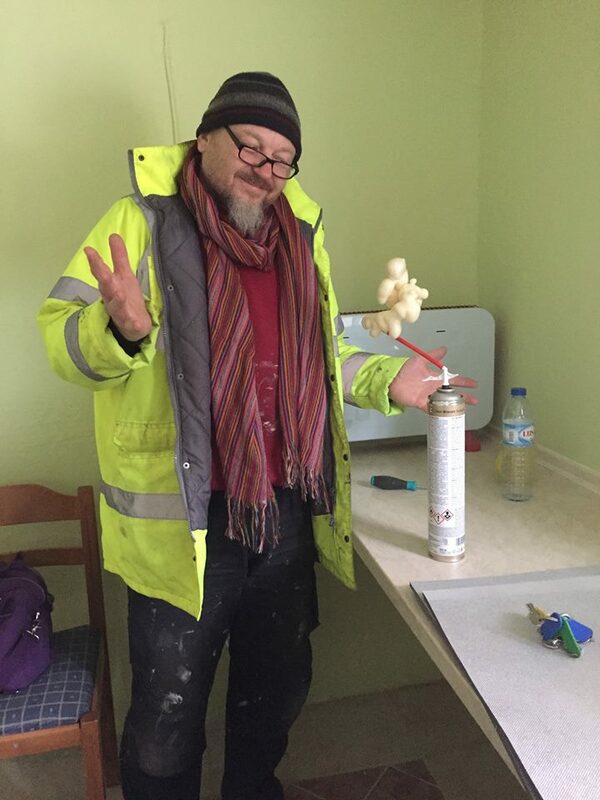 With the help of our volunteer, Dave, there is now a Barbershop corner, tables for card and board games, and a kitchen space for making chai and coffee. The next aim is to install a projection screen and suitable internet so that the men on camp have a place to watch movies and football or spend some time with friends. The women's space is now finished! With the help of some incredible donors we can now offer sewing equipment, beauty products and a space for the ladies to enjoy. They have taken full responsibility of the space, meaning we have given them a key and they can use it as they please. We do our best to provide activities for kids and adults, whether that's toys to play with, sports games or movies. So far we've shown a movie per week since starting up the kids cinema, we also had a visit from William Johnson with his mobile cinema! Films like Frozen, Finding Nemo, The Lorax, Aladdin, all in Arabic of course. As the area that we distribute in is where the military food is given out, we hold ad hoc kids games, drawing & colouring, football when time and volunteer numbers permit. For adults we currently have some but few activities available until the dedicated spaces are launched.